Summary: A show as delightfully zany as Adventure Time deserves much better that this bland and uninspired pastiche of top-down dungeon crawler mechanics and the brief flashes of irreverent humour and charm that appear throughout can’t save this rushed and dull waste of a license. Title: Adventure Time: Explore the Dungeon Because I DON’T KNOW! Shmowzow! I’ve previously made no effort to hide my overwhelming love for Pendleton Ward’s quirky hit Adventure Time, so when I heard that the cult animated series was finally going to make the leap onto home consoles with Adventure Time: Explore the Dungeon Because I DON’T KNOW! 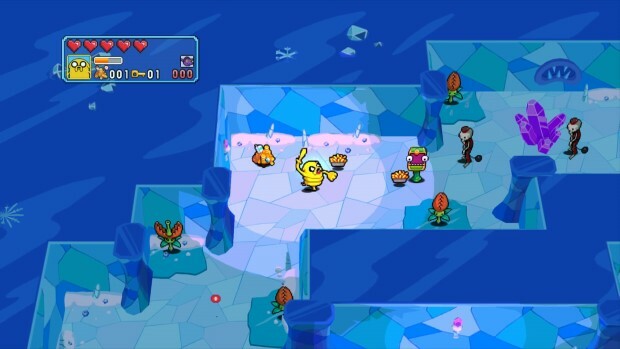 – The follow up to the generally well received 3DS/ DS exclusive Hey, Ice King! Why’d you Steal our Garbage? – I was understandably excited. Heck, the show’s practically a video game anyway, what could go wrong? 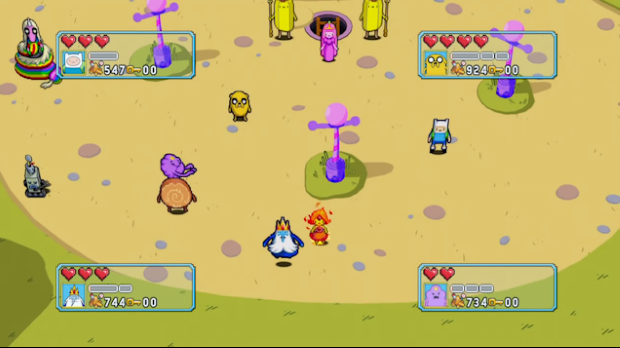 Given the premise of the show and its roots in the aesthetics of Dungeons and Dragons and retro gaming, from all outward appearances it would appear that Adventure Time would be the ideal candidate for an interactive adaptation, with the rich tapestry of the source material allowing for possible entries across multiple genres of gaming; the show could easily translate into a 3D platformer, a puzzle game, an RPG or even an RTS, with the possibilities only really limited by the abilities and vision of the developer… Which makes WayForward’s choice to present the game as an Old-School dungeon crawler rather curious. 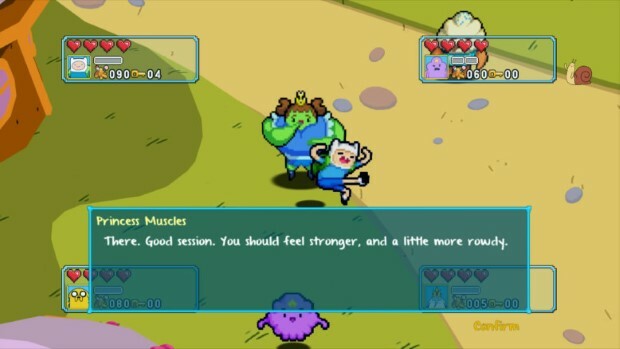 On paper you can kind of see why this (Slightly Outdated) choice of genre would seem like a perfect fit for the show: Finn and Jake frequently traverse dungeons in search of both treasure and adventure in the show and the mechanics and controls can remain simplistic enough to appeal to a younger demographic whilst the nostalgic gameplay and use of the license should keep the older fanbase covered. 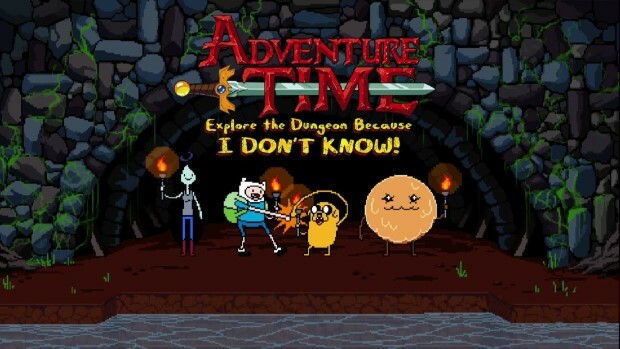 Plus, with the creative input of Ward and Co. driving the narrative (Including a major plot reveal that’ll come into play in later seasons of the series), hopes were decidedly high once WayForward announced Adventure Time: Explore the Dungeon Because I DON’T KNOW! would be coming to home consoles. 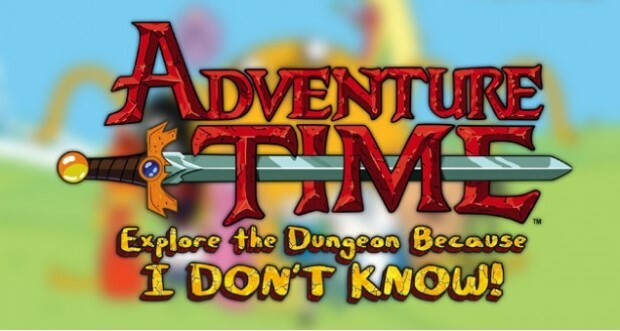 After a delightfully kitschy retro opening sequence (Complete with a catchy chiptune rendition of the show’s theme), Adventure Time: Explore the Dungeon Because I DON’T KNOW! opens with Princess Bubblegum summoning our intrepid heroes to a secret subterranean dungeon where the most dangerous of the Land of Ooo’s denizens are imprisoned; due to some unknown event, the prisoners have been freed, so Princess Bubblegum tasks Finn and Jake with journeying through all 100 levels of the dungeon in order to quell its rioting inhabitants and discover the root cause of the pandemonium. 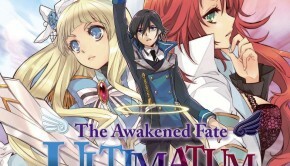 With the assistance of undead Vampire queen Marceline and Cinnamon Bun, players must hack ‘n’ slash their way through randomly generated dungeons, fending off attacks from all manner of vile beasts whilst shovelling as much loot as possible into their pockets – Basically, it recalls the basic principles of the plundering of Diablo and the possibility for four-player dungeon action a la Gauntlet. Unfortunately, Explore the Dungeon doesn’t manage to capture the excitement of those aforementioned titles, nor capitalise upon the potential of its imaginative license, with the final product being one of uninspired monotony and lazy game design. The brief synopsis above pretty much sums up the main crux of the game – You traipse through seemingly endless dungeons, collecting loot and fighting a surprisingly dull menagerie of monsters using a basic one button attack, occasionally coming up against one of ten bosses before coming up for air long enough to attempt to purchase a ridiculously priced upgrade or piece of equipment before descending into the abyss once more. There’s little variation to the enemies or the methods for dispatching them, with combat eventually boiling down to little more than mashing a single button and timing your attacks correctly, occasionally chucking in a quick burst of fire from your Kitten Gun for good measure. 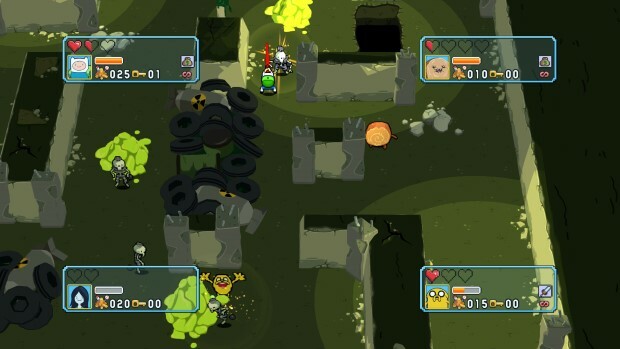 There’s also little difference between the initial selection of four characters, besides appearance; Jake can stretch over the myriad of pits that litter the dungeon, making navigation easier, but neither Finn or Cinnamon Bun really offer up anything unique to compensate for their inability to deviate from the set path. 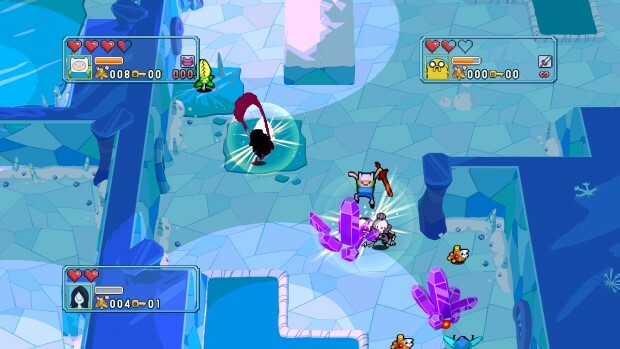 Each character has a special attack, can use sub-weapons and can dodge and block, with the exception of Marceline, who trades off the power of flight and increased speed against being able to deflect blows; despite this, Marceline is easily the best character to use, as her hovering ability alleviates any woes regarding exploring the maze-like layout of some of the levels. You return to the extremely limited overworld every five levels and can use your loot to upgrade your character stats, purchase some items, equip a token or two, store some equipment and complete a side-quest or two before returning to the depths of the dungeon penniless, as any remaining cash will be pilfered by Princess Bubblegum, under the guise of “Candy Tax”, upon re-entering the dungeon. This is a cheap tactic to get you to spend rather than hoard, often leaving the better items constantly hanging tantalisingly out of reach due to the scarcity of treasure available during a five level sojourn. 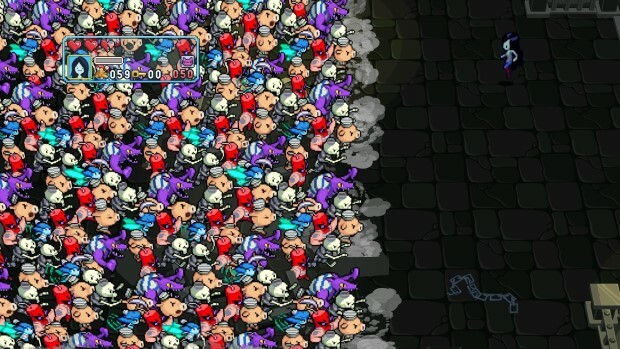 Despite being randomly generated, most of the dungeons still manage to feel the same and quickly become visually stale by the tenth level, where you’ll the square off against a boss; the theme of the dungeon changes after each boss battle but, again, you quickly become accustomed to it and start to crave more variation. The boss battles themselves actually show a bit of the fun and creativity that much of Explore the Dungeon seems to be lacking, with these charming sequences easily coming off as the most satisfying and reminiscent of the spirit of the show. The story is moved along via crudely animated 8 bit styled cutscenes, which, while infrequent, are a welcome bit of levity to break up the mind numbing drudgery of trawling through the dungeons. These interludes are also voiced by the main cast, which is a nice touch that’ll be sure to go some way towards appeasing fans. You can play with up to 3 other friends via local multiplayer but even this fails to really ignite any passion for the game, which is a bit disheartening; as a rule of thumb, even the worst games can be kinda fun with friends, but that’s really not the case here. 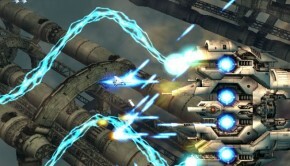 The lack of any kind of online multiplayer is a curious omission as well. Visually Adventure Time: Explore the Dungeon Because I DON’T KNOW! adheres to that retro 8-Bit aesthetic that seems to be all the rage now. The cutscenes are crudely animated in an attempt to be endearingly nostalgic but, all too often, the pictures can come off as a little too underdrawn and venture into lazy territory. The opening is charmingly rendered and the writing (What little storyline there is, anyway) is generally amusing and captures the spirit of the show, complemented for the most part by the game’s visuals. During the dungeon exploration sequences the graphics change to an overhead isometric view style reminiscent of Gauntlet, with the pixelated enemies suitably rendered, although often unimaginatively realised in their design. The game effectively captures the atmosphere of an old school dungeon crawler in a visual sense but, in today’s day and age, this kind of half-hearted effort, even when ostensibly used ironically, just doesn’t cut it. Given the sumptuous visual feast that is the source material, graphically Adventure Time: Explore the Dungeon Because I DON’T KNOW! is sadly disappointing. The audio, on the other hand, is pretty top notch, with cute chiptune music and the participation of the cast ensuring that Adventure Time: Explore the Dungeon Because I DON’T KNOW! is a treat for the ears, if nothing else. 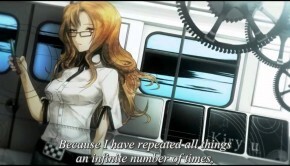 The game would have benefitted greatly from more cutscenes to highlight the great performance of the cast; some of the one-liners during gameplay can get a little bit repetitive, but as a fan, this was the one area in which I didn’t feel let down in the slightest. Adventure Time: Explore the Dungeon Because I DON’T KNOW! 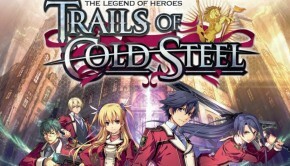 doesn’t set its sights too high but unfortunately fails to reach even WayForward’s decidedly humble ambitions. 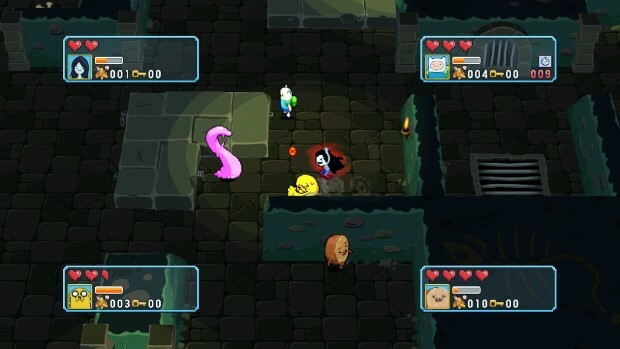 Licensed games have a history of ultimately being unsatisfying but lately the trend appeared to be experiencing a seachange; Unfortunately Adventure Time: Explore the Dungeon Because I DON’T KNOW! brings back horrible memories of the 90’s and the glut of terrible film to game conversions. A show as delightfully zany as Adventure Time deserves much better that this bland and uninspired pastiche of top-down dungeon crawler mechanics and the brief flashes of irreverent humour and charm that appear throughout can’t save this rushed and dull waste of a lucrative license.